Atlanta is more than the Georgia state capital … it is also the unofficial capital of the South. It has to be unofficial because there is no such entity to give it that honor and designation. But everybody knows it to be true, and it’s been that way for at least 150 years. Ever since General Sherman began his March to the Sea from Atlanta, in which he burned and looted every hostile area between there and Savannah, the perception has been that as Atlanta goes … so goes the South. Indeed, Confederate General Robert E. Lee was devastated by Sherman’s Atlanta destruction and it contributed mightily to the end of the Civil War. However, Atlanta would not stay down for long and would rise again! The city even hosted the 1996 Olympic Games. Look at Atlanta today. Big and sprawling. It is ranked number 45 of world cities and the 9th largest metropolitan area in the United States with 5,522,942 population. 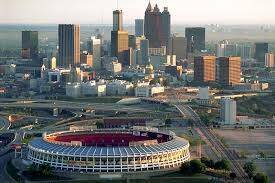 Atlanta is the economic and cultural center of the South, with beautiful rolling hills and thick, luscious trees throughout. Many businesses make it their corporate headquarters, including Coca-Cola, as it is favored by professionals in nearly every business sector. Ted Turner created CNN in Atlanta, the very first 24 hours news cable channel. Folks thought Turner was nuts for doing that, but it turns out he was crazy like a fox. Others would later emulate his business model. All those big businesses mean people are relocating frequently from and to Atlanta. Atlanta was also home to quite possibly America’s greatest orator, Rev. Martin Luther King, Jr., who led the Civil Rights Movement in the 1960’s to bring equality and justice to America. King’s very last speech the night before he was assassinated will bring chills down your spine. See at the bottom of this page what we lost as a nation. So prophetic, inspiring and spellbinding. We haven’t seen his kind since. Atlanta is a big sports town too, which only makes sense because there is a ton of money there. There are the NFL’s Atlanta Falcons football team, NBA’s Atlanta Hawks basketball team and the most successful of the three, the Atlanta Braves baseball team, which Ted Turner once owned that too! The Jimmy Carter Presidential Library & Museum is located in Atlanta. For all the nit-picking criticism President Carter has received over the years, facts are facts and one incredible fact remains. 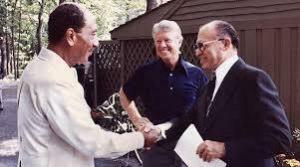 The Israeli-Egyptian Peace Treaty that President Carter negotiated at Camp David in 1979 between Begin and Sadat remains in place. It worked! Peace is possible in the Middle East and Jimmy Carter proved it. Way to go Jimmy! All roads lead to Atlanta, which is befitting a capital of the South. It is one of our favorite cities for car shipping. From the north and Tennessee, I-75 passes straight through downtown Atlanta on its way to Florida. From the northeast Charlotte, North Carolina side, I-85 cuts diagonally through downtown and continues on to Auburn, Alabama and beyond. Coming directly from the east side Columbia, South Carolina, I-20 splices Atlanta on its way west to Birmingham, Alabama. Atlanta is completely circled by a major bypass freeway, I-285 which allows our auto transport carriers to avoid downtown traffic if they so desire. Atlanta is a favorite car shipping city for Direct Express Auto Transport. Our original car transport quote calculator produces reliable quotes from and to Atlanta. Try it on this page today!